If there's no other explanation, it Must Be Art. Strobes like the Paul C. Buff White Lightning X1600 and Alien Bees have a 6P4C modular connector (like a RJ14 telephone wall cord) marked REMOTE. This connector provides strobe sync, strobe power control, and modeling light power control. The following information was obtained by studying the LG4X wired remote controller and X1600 strobe. Later models (such as the Einstein) clearly have more going through this connector. The common and sync pins are electrically connected between all four sockets on the LG4X. The modeling light control is also a simple DC voltage. 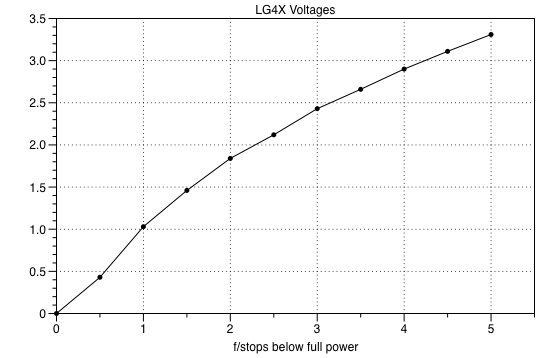 When the LG4X switch is set for full power modeling lights, this voltage is 0. When the switch is set for modeling lights OFF, this voltage is 5.0V. When the switch is set for tracking, the voltage is connected in parallel with the strobe power voltage. The sync pin idles at +5V with respect to the common pin. When the FIRE button on the LG4X is pressed, a single 1 millisecond pulse at 0V is output. This pin is also in parallel with the tip of the SYNC jack on the LG4X, so an external contact closure on the SYNC port also drives this voltage to 0. That’s all there is to this interface, at least as far as the LG4X wired remote is concerned.